Dangerous holes and rotten planks held aloft by tiny pieces of rusted cable stretch as far as you can see. Somewhere below you lies an immense body of water… The howling wind makes the bridge sway side to side and as you grab a railing to hold onto, you suddenly feel how the heart starts to beat faster. Unlike gephyrophobes, many daredevils seek out extreme bridges and hiking trails just for the thrill. An intense fear of heights can trigger gephyrophobia, the fear of bridges. “It is an accepted psychological diagnosis,” stated Dr. Michael R. Liebowitz in an interview for Msnbc.msn.com. Get ready to face your fears, or maybe find your lifetime adventure, with our list of top 10 most adrenaline pumping hiking trails and bridges. Let’s start with something less scary, shall we? Trift Bridge is the longest pedestrian-only suspension bridge you’ll find in the Alps (if not in Europe). The 557 feet long bridge strung 328 feet above the Trift gorge is located in an area that receives more or less 20,000 visitors per year. Don’t look down the bridge. Suspended at a spine-tingling height, the bridge may sway in windy conditions. Keep your eyes locked on the magnificent surroundings and you’ll be fine. A 430 feet-tall arch dominates the skyline of the Tianmen Mountain National Forest Park, often referred to as the “the soul of Zhangjiajie”. Heaven’s Gate is an impressive arch that formed naturally. It is 100 feet wide and stands at an elevation point of 4987 feet. One has to climb no less than 999 steps to reach the top. Number nine carries sacred connotations in Chinese culture and its multiples 99 and 999 play an incredibly important role. The Big Gate Road, aka Heaven Linking Avenue, takes you from 656 feet below sea level to 4265 feet above sea level. Guess how many hairpin turns there are on this serpentine road? 99! Don’t worry; ascending to Heaven’s Gate by cable car is an alternative. Another literally breathtaking attraction the park has to offer is the Glass Skywalk Trail, the highest of its kind in the world. It is 70 feet long, 3 feet wide and only transparent glass has been used for the construction. The skywalk stands at approximately 4700 feet AMSL. Tourists are provided with shoe covers to protect the glass and avoid slipping. No jumping and running to test the quality of the glass. Remember, this is China! Take no chances with your own safety. 3,922 metal stairs rise 2,800 feet into the clouds on the island of Oahu, Hawaii. As part of a large military radio communication system, the Haiku Stairs were built in 1943 to facilitate the installation of antenna cables. They are currently off-limits to the public due to safety and liability concerns. Despite the warnings, hikers ascend the stairs in pitch dark to avoid getting caught. City officials have delayed reopening the Ha’iku Stairs after a Circuit Court decision that found the state negligent, partly because of poor signage, in the fatal 1999 rockslide at Sacred Falls, wrote Eloise Aguiar for The.HonoluluAdvertiser.com. The landslide killed eight people and injured other 42. Rising more than 4,737 feet above Yosemite Valley and 8,848 feet above sea level, Half Dome is the signature landmark of the park. Despite an 1865 report declaring that it was “perfectly inaccessible, being probably the only one of the prominent points about the Yosemite which never has been, and never will be, trodden by human foot,” George Anderson reached the summit in 1875.” (NPS.gov) Nowadays, thousands of hikers reach the summit each year by following an 8 mile-long trail, including several hundred feet of granite stairs and miles of switch backs. The last 400 vertical feet are ascended with the aid of two metal cables. Few hikers have fallen and died here. However, injuries and accidents are not unusual for those behaving irresponsibly. Number six goes to a very special bridge. Keshwa Chaca is believed to be the last remaining Inca rope bridge. To build it, the Incans used natural fibers available locally. Each June, the people of the nearby communities renew Keshwa Chaca even though a wider and safer bridge has been built for normal use. It’s all about keeping the tradition alive and honoring the ancestors. The handwoven bridge is 118 feet long and hangs 220 feet above the Apurimac River. It takes a brave (or nuts) soul to cross the next bridge on the list. 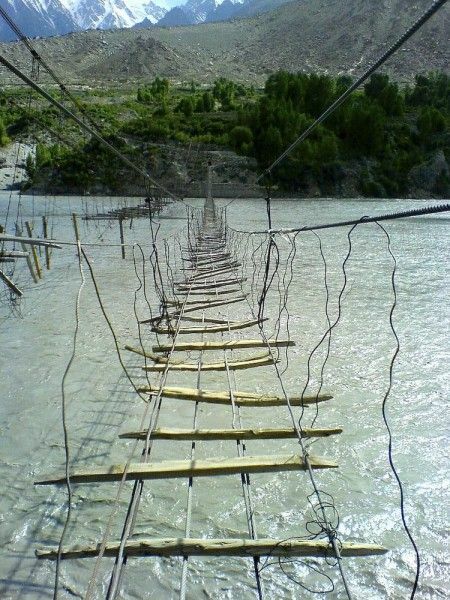 Believe it or not, the people who live in the Hunza Valley, Pakistan and need to travel to a nearby town or village cross the Hussaini Bridge on a regular basis. It is located above Lake Borit, in the Upper Hunza. Despite its precarious and dangerous state, the Hussaini Bridge attracts countless hikers who want more than the typical “leg stretcher” walk. 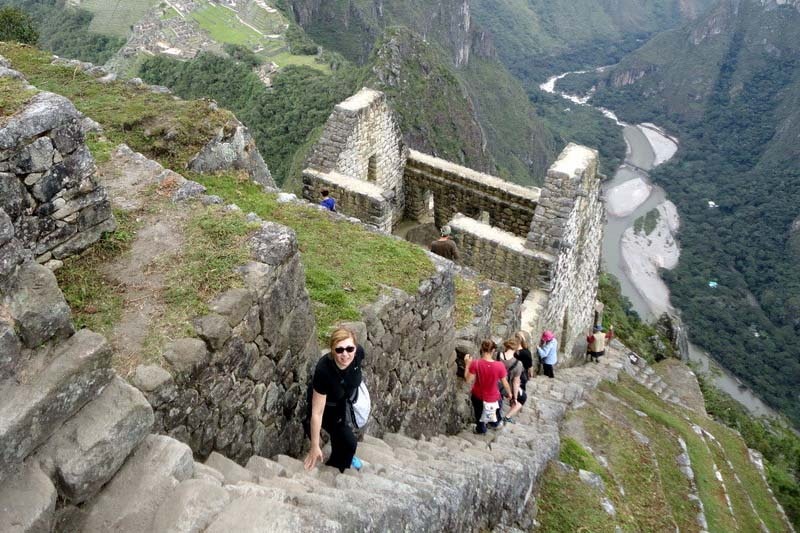 The world-wide famous Inca Trail to Machu Picchu consists of three overlapping routes: Classic, Mollepata, and One Day. Visiting this World Heritage site involves climbing lots of steep and narrow stairs. The trail is extremely strenuous, but well worth it. The Incans were great mathematicians and engineers and they are the ones who invented the floating steps, steps that appear to seamlessly float from the wall. Imagine you’re at 8,000 feet; would you climb those stairs, given the possibility of a long fall? Angels Landing – earlier known as the Temple of Aeolus – is the summit of a long, narrow rock formation located in Zion National Park, Utah. The 2.4 miles long trail starts at the Grotto area of the park and ascends 1,488 ft. to its 5,780 ft. end point, a peak once described as so small and isolated that “only an angel could land on it.” (ZionNational-Park.com) Frederick Fisher exclaimed this phrase while exploring the park almost 100 years ago. That’s how the monolith got its name. The most challenging and dangerous section of the trail begins after Scout Lookout, the turnaround point for those who are inexperienced or less fit. This last half-mile is a series of rock steps so narrow (less than 2 feet) and abrupt that support chains had to be anchored intermittently. The trail drops 800 feet on one side and 1,200 on the other. The King’s Little Pathway (Spanish, El Caminito del Rey) is a crumbling walkway pinned along the walls of El Chorro, a huge limestone gorge near Álora. The walkway is between two and three feet wide, and rises over 350 feet above the Guadalhorce river. El Caminito del Rey has been dubbed “the most dangerous path in the world.” (DailyMail.co.uk) After several tragic accidents, the Spanish authorities officially closed the trail in 2000, but adrenlaine junkies still manage to get around the barriers. How far away would you travel for an adrenaline rush? This route guarantees to thrill even the most experienced hiker. Mount Hua Shan is one of China’s five sacred mountains and it is known as “the Number One Precipitous Mountain under Heaven”. According to countless sources, the Hua Shan trail is one of the most dangerous hiking trails in the world. “Chinese official statistics put the death toll on this hike at a comforting zero (how comforting indeed), but non-Chinese figures show a much higher rate of death, some of them putting it as high as 100 per year,” wrote Ben Beiske on TravelBlog.org. The ability and mobility to hike on 1 foot wide planks and steel bars determines whether one reaches the peak for spectacular panoramic views, or plunges into the abyss (I’m talking about the crazy hikers who prefer to experience Mount Hua without any safety equipment). As you can notice from the image, there’s a chain around the cliff, so pack a harness or rent one from the base if you plan to hike this peak. This is an awesome list,felt the adrenaline even while sitting in the comfort of my home. Wow me too! It was a very good list. I googled each trail/bridge. I don’t have the balls to attempt one of these. This is quite possibly the most boring topic I’ve seen on the site in awhile. To each his own, I guess.